Well the data is in. Synthetic grass conserves water! The Legislative Analyst’s Office released their Water Use trends report. The report is the result of two years of data collected from various municipalities. Some of the results were surprising, but make sense after explanation. Let’s walk through some highlights. Ultimately, you will see synthetic grass definitively impacts the water conservation landscape. Of course, we know synthetic grass requires no watering. Therefore, you will be saving the amount of water normally used to water your lawn. But just how much is that? This is where the report gives perspective. In 2016, Californians used 85 gallons of water per day. Keep in mind, this is a per-person average. Of course, there were some variations During summer months, usage was considerably higher. For instance, from June to September Californians average 109 gallons of water. However, compare the per-person average to the cooler months of January through March and the per capita usage is almost cut in half, to 64 gallons per day. What is most interesting about the report, however, is the discrepancy between 2016 and 2015. In 2016, water usage was 15% lower on average when compared to the same months of 2015. 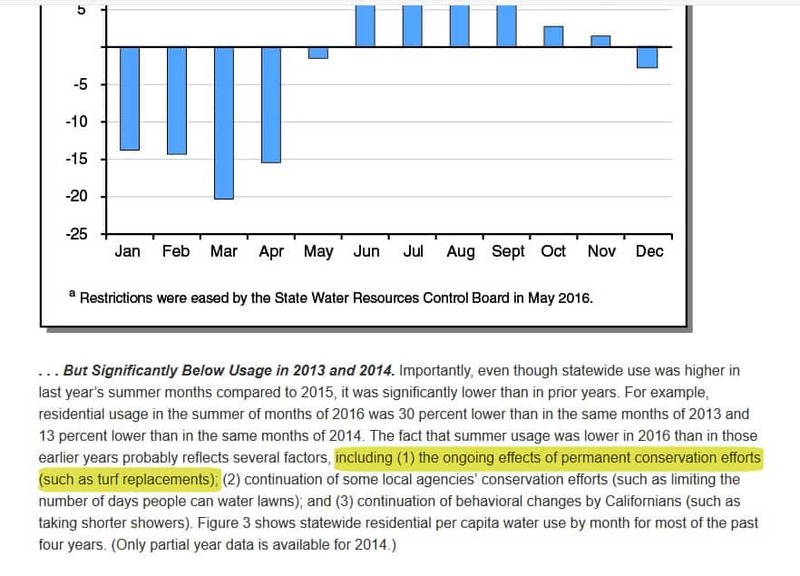 However, during the summer of 2016, water usage was 11% higher on average when compared to the same months in 2015. Before you scratch your head over this, think for a minute. Water restrictions were eased a bit during May 2016. They had been been in place since June of the previous year. This explains the spike. Furthermore, there was significant rainfall between October and December 2016, which accounts for water usage being similar to the same months by comparison in 2015. Per the Analyst’s Report: Synthetic Grass Conserves Water! So, we see supposed outliers or oddities are easily explained when you think through the equation logically. However, compare these numbers to water usage between 2013 and 2014. That’s when things get really exciting. In 2016, water usage per capita was significantly lower when compared to 2013. How much more? Well, how about 30% lower for 2013 and 13% lower for 2014. And while several factors are listed as contributors, such as ongoing conservation efforts by agencies (i.e.water restrictions), and the continual behavioral changes of Californians, it is also noted that permanent conservation efforts, such as turf replacements, are a contributor as well. In short, synthetic grass conserves water! Look at the image below! This is exciting news for those of us who work so diligently to make a difference with synthetic grass. The data proves the case without any shadow of doubt. Synthetic grass conserves water. However, there has been a recent push to provide rebates for drought tolerant landscapes with the exclusion of synthetic grass. In fact, only a few municipalities still provide rebates for switching your natural lawn to synthetic grass. Even worse, they are not spread across the state. Many of them are municipalities located in or near Los Angeles. Instead, the shift is moving towards drought tolerant landscapes (cacti, boulders and mulch). Yet, don’t let this dissuade you from considering synthetic grass as an option. While the legislative gods of tax rebate programs are leaning in another direction, there are still several great reasons to consider synthetic grass. 1. Little to no Maintenance. To begin with, synthetic grass requires little to no maintenance. That’s right, mowing your lawn, raking debris and using a weed eater or things of the past. You might want to keep a blower handy for the occasional shedding of leaves or other minor lawn debris. However, intensive yard maintenance is gone forever. 2. No Pesticides or Fertilizers. Second, consider all of the fertilizers and pesticides you use to maintain a natural lawn. Those are no longer required when you switch to synthetic grass. In fact, you won’t notice any tests in your yard at all. No more ant bites or spiders to contend with. The environment isn’t suitable for a bug’s life (sorry Disney). Instead, you can lay across your lawn without the worry of creepy crawlies bothering you. Also, it really is the ultimate eco-conscious choice. Consider this, no lawn equipment means no greenhouse gases spewing into the air. No fertilizers or pesticides mean no harmful chemicals that could end up in your water supply. And finally, since we are speaking of water, you won’t need to use any to keep your lawn green. Synthetic grass is the ultimate one to combo punch when it comes to water conservation. Not only are you making an impact by using less water, you are protecting your water supply since you don’t need harmful chemicals to maintain your lawn or keep it free of pests. 4. It Ultimately Pays You. Finally, while synthetic grass conserves water, it pays you in the long run! This is why we say don’t get down over dwindling tax rebates. Just because the government isn’t willing to pony up money as an incentive for you to switch to synthetic grass does not mean there exists no incentive at all. On average, a synthetic lawn begins to pay you within five years. Think about that the next time you see your neighbor sweating it out, cutting grass. After five years, the money you spent installing your artificial lawn zeros out. The column then moves from an expense to an asset. This is why so many Californians in the Greater Bay area and beyond choose NewGrass. It is the only drought tolerant solution that both conserves water and saves money. Where drought tolerant landscapes may cut a portion of your water bill, synthetic grass cuts all yard maintenance! Are you considering a switch? Call or Contact NewGrass today. We have the one of the most advanced product lines in the industry, and will work with your budget. Conserve water by making the switch. Enjoy the benefits for a lifetime!